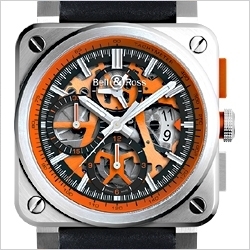 Headquartered in Paris, France and founded in 1992, the industrial designer Bruno Belamich and his friend Carlos Rosilli created Bell and Ross, a Swiss watchmaking company that specializes in making professional tool-based watches for pilots, divers, mine clearance experts, and astronauts. The company believes that the essential is never compromised by the superfluous, which is why the majority of their collections are neither flashy or have unnecessary design features. 24diamonds.com offers only brand new and 100% authentic Bell and Ross watches for sale. Positioned in a highly competitive market, Bell & Ross watch brand has made a name for itself with water resistant world record of 11,110 meters and in its luxurious synthesis of functionality and stylish design. The collections of Bell & Ross watches take inspiration from the cockpit instrumentation dashboard of the 1920s, reinterpreting the classic military watch design and paying tribute to the world’s military forces. With five major collections that correspond to different periods in history of aviation (PW1, WW1, Vintage, Marine, and Aviation) each design ups its technical prowess and stylistic revolutions. The company values four main principles, which are legibility, functionality, reliability, and precision. This is why you see their collections have large numerical values, numerous display options, multiple modes of functional movement, and superior craftsmanship; which can be clearly seen in their more complicated tourbillon models. Those in professions that require absolute precision, such as the Armed Forces, special law enforcement, submariners, bomb disposal divers, fighter pilots, and astronauts all use the Bell and Ross collection series, as superior tools for completing their missions. 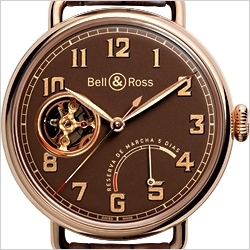 Bell & Ross presents unique Vintage WW1 watch collection that is a reinterpretation of classic military watch design, paying tribute and homage to the world’s military forces; particularly the pilots of the roaring twenties. Taking inspiration from the world of aviation, these Bell and Ross watches blend an aircraft interface with performance, precision, and readability. Built with a rich heritage in mind, these watches feature classic, stainless steel cases, with round designs and diameters of 41, 42, and 45 millimeters in width. All watches are water resistant from 100 to 330 feet, have anti-reflective sapphire crystals, and come with either a transparent or solid case back. As for dials, the collection features opaline, galvanic black, brown, silver, or ivory and the straps come in various colors of leather. The bezels range from platinum to rose gold, while the clasps are exclusively pin buckle in design. Functional movement is either automatic or manual and comes with hour, minute and second functions. New Vintage WW2 watch collection by famous Bell & Ross brand is a re-imagining of period military watch design, and is a tip of a hat to the world’s military forces; namely those listed in WW2 unlike Bell and Ross WW1 Collection. Deriving further inspiration from aviation, these watches focus on readability and ease of use, even when wearing gloves. Taking into account the rich heritage behind them each WW2 watch boasts a case of either stainless steel, titanium, or rose gold and are round in shape with a whopping 49 millimetre diameter. Every available model can survive up to 165 feet underwater, are made with anti-reflective sapphire crystals, and have either a solid or transparent back. The dials of these Bell and Ross watches come in matte black or dark brown and each strap comes in various colored leathers. The bezels match their cases, ranging from stainless steel to rose gold, and the clasp comes in a pin buckle design. Functional movement can be automatic or manual winding, and each WW2 watch displays hours, minutes, and seconds. Vintage BR V is one of classic watch collections by Bell & Ross which continues to draw inspiration from the historical world of military aviation while taking on a more elegant form than the WW1 and WW2 series. These Bell and Ross watches, while remaining true to their aircraft dashboard look, focus more on their aesthetic appeal. Adopting Bell and Ross' signature heritage look, each case is made from stainless steel, are round in design, and are smaller than the WW1 and WW2 collections with the biggest one being 41 millimeters in diameter as opposed to the 49 millimetre of the WW1/2 series. Each model can by submerged in water, up to 330 feet, come with anti-reflective sapphire crystals, and come with transparent or solid backings. The dials of this collection come in matte black, gilt, blue and white with the straps being of various colors of leather or stainless steel links. The bezels match the dials of each watch and some models come with a rotational bezel that have minute indicators. The clasps come in either a pin buckle or folding design. Functional movement can be automatic winding, and each BR V watch displays hour, minute, second and date functions. 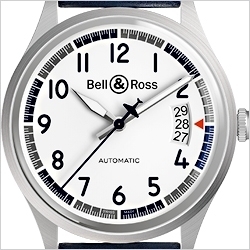 Bell & Ross presents an iconic Instruments BR 01 watch collection that is modeled after the aesthetic of an airplane cockpit dashboard clock. Each watch comes with a square case, modular design, and retention screws that are reminiscent of what you would see on dashboard of a pilot’s instrument panel. This means that most of the watches within this collection come with large hands, bright colors, and easy to see numerals. Each case is square, measures 46 millimeters in diameter, and comes in stainless steel, black stainless steel, rose gold, and bronze. Each model can be submerged in water up to 325 foot, come with anti-reflective sapphire crystals, and come with transparent or solid backings. The dials of this collection come in aluminium carbon fiber, black carbon fiber, black, red, metal, black and white, and white lacquer. The bezels match the cases, the straps come in either rubber or leather, and the clasps come in a pin buckle design. Functional movement can be manual or automatic winding and each Bell and Ross BR 01 watch displays hours, minutes, and seconds. If you choose one of the more luxurious models, the watch will display small seconds, power reserves, timer, and tourbillon. Instruments BR 03 is a classic watch collection by Bell & Ross. The series has BR 03-92 Diver, BR 03-92 Ceramic, BR 03-92 Steel, BR 03-96 Grande Date, BR 03-97 Reserve De Marche, BR 03-90 Grande Date Et Reserve De Marche, BR 03-51 GMT Et Grande Date, BR 03-93 GMT and BR 03-94 Chronographe timepieces. Bell and Ross Instruments BR 03 features Swiss made watches that incorporate functionality, precision, reliability, and legibility into their design. Each watch is made with a square case and come with the retention screws that are similar to the BR-01 collection. What makes this collection popular and iconic is their low-light readability conditions and modern design. Each case comes with a square design, measures 42 millimeters in diameter, and is available in white ceramic plated steel, stainless steel, rose gold, and matte black steel. Each model can by submerged in water from anywhere of 325 to 1000 feet, come with anti-reflective sapphire crystals, and have solid backings. The dials of this collection come in black, white, green, blue, silver, beige, orange, or gray tinted mineral. For the majority of the watches in this collection, the bezels match their respective cases, the straps come in various colors of leather, canvas, or rubber and the clasps come in a pin buckle design. Functional movement is automatic winding and each watch displays hours, minutes, and seconds. Some models will also display chronograph and date functions. 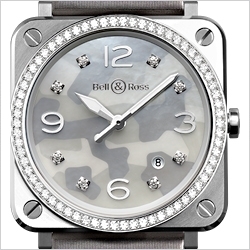 Instruments BR S watch collection by Bell & Ross would be a perfect choice for both women and men. 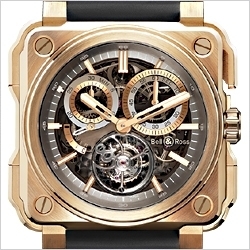 This is the smallest square framed watch type that you can buy from Bell and Ross brand. While remaining faithful to aeronautical design, these come in a much more aesthetically pleasing and flashier form with some models even having diamonds built into the dial or the bezel. 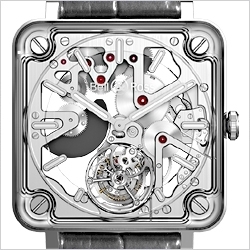 Each case is square in shape, come with retention screws, and measure 39 millimeters in diameter. They are available in rose gold, stainless steel, white and black ceramic. The BR S watch collection can be submerged in water between 165 – 325 feet, come with anti-reflective sapphire crystals, and have solid backings. The bezels on each watch match their cases, some of which come with sixty-six white diamonds of 0.99 Carats, have various options for colored leather, rubber or Milanese mesh steel, and the clasps come in either a pin buckle or folding design. 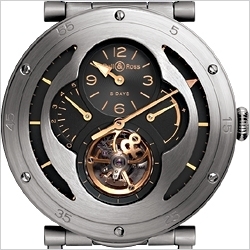 Functional movement is automatic or quartz, and each Bell & Ross watch displays hours, minutes, small seconds and date. 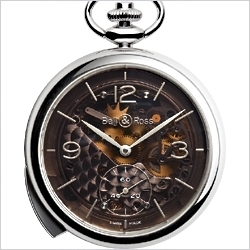 If you're looking for a timepiece of art, this Experimental BR-X1 watch collection by Bell & Ross is a perfect find! It is ideal for individuals who appreciate timepiece virtuosity or great technical watchmaking skill. This Bell and Ross collection feature Tourbillon and Chronographe watches that are striking in their aesthetic and stunning in their capability. Each case is square in shape, come with retention screws, measure 45 millimeters in diameter, and come in sapphire, rose gold, bronze, and titanium with ceramic. Each model can by submerged in water up to 325 feet, come with anti-reflective sapphire crystals, and have transparent backings. The bezels on each Experimental BR-X1 watch match their cases, have various options for colored leather and rubber, while the clasps come in a pin buckle design. Functional movement is manual, or automatic and each watch displays hours, minutes, seconds, chronograph and date. 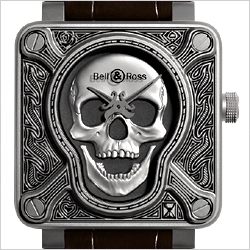 Truly unique watch creations are presented by Experimental BR-X2 collection by Bell & Ross brand. BR-X2 Tourbillon watches in this series are all about fusing the case and the movement into one single, fluid action allowing the case to completely disappear from view. The idea with this collection was to keep the square case design but remove as much extra material as possible to allow for virtual invisibility. The Bell and Ross collection is limited to two options, the BR-X2 Skeleton Tourbillon Micro Rotor Watch and the BR-X2 Tourbillon Micro Rotor Watch, both of which come with retention screws and anti-reflective sapphire, and are 42.5 millimeters in diameter. Both have stainless steel cases, have a gray alligator leather strap, and have a folding steel clasp. Each model can by submerged in water up to 165 feet and do not come with a bezel. Functional movement is automatic and each watch displays hours, minutes, and flying tourbillon. If you're looking for a luxurious pocket watch then you need to explore this Vintage PW1 collection by Bell & Ross. It is a reinterpretation of classic military watch design, reminiscent of 16th century pocket watches. With a limited offering of five pocket watches, individuals will find that these models blend classic European design with readability and aviation history. Each case model is round in shape, measures 52 millimeters in diameter, and come in either stainless steel or argentium. All Bell and Ross pocket watches are water resistant up to 100 feet, have anti-reflective sapphire crystals, and come with a solid case back. As for the dials, they come in heritage brown, black, skeleton, Ruthenium and white. Functional movement is manual, and comes with hours, minutes and small seconds functions. The Repetition Minutes Skeleton comes with the additional 5-minute repeater display.